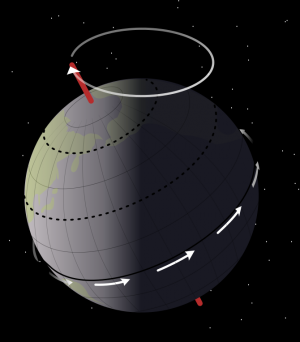 Earth's precession was historically called the precession of the equinoxes, because the equinoxes moved westward along the ecliptic relative to the fixed stars, opposite to the yearly motion of the Sun along the Ecliptic.The precession of the Earth's axis has a number of observable effects. First, the positions of the south and north celestial poles appear to move in circles against the space-fixed backdrop of stars, completing one circuit in approximately 26,000 years. The Precession of the Equinoxes is used interchangeably to describe the mechanics of the Ascension cycle as the evolutionary progression of humanities consciousness expansion on the earth. 4 Planetary Rounds = 1 Planetary Cycles = 1 Astrological Age = Aeon = 26,000 (26,566) years = precession of Earth’s axis of rotation with respect to inertial space. 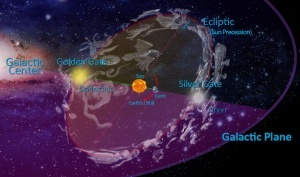 At the end of every cycle, we become aligned to the galactic core; Stargate portals open (See Planetary Gates, and we are eligible to proceed with an Ascension timeline. Refers to the precession of Earth's axis of rotation with respect to inertial space. 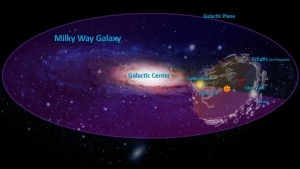 Inertial space is a coordinate system (or a frame of reference) defined with respect to the distant stars, whose relative positions do not change over reasonably long periods of time. A complete precession cycle (One Astrological Age) covers a period of approximately 25,765 years, the so called Great Platonic Year, during which time the equinox regresses over a full 360°. The precessional movement also is the determining factor in the length of an Astrological Age or Aeon. (Note that there are 12 Zodiac Archetypes that are each of the 12 Astrological Ages. We are moving from the Age of Pisces to the Age of Aquarius.) The precession of the equinoxes is caused by the differential between the gravitational forces of the Sun and Moon on the Earth. Ascension is the complex quantum mechanics governing the movement of consciousness through time and space. Consciousness is energy, as well as, energy is intelligent consciousness. When energy shifts, so does our consciousness. Time and space as we have known on planet earth is changing, and we are moving into a future timeline. Through gradual exposure to frequency activation of various stellar bodies, the planet is transformed into higher dimensional and frequency planes of existence. One can consider the multidimensional model of our reality through the study of the Universal Time Matrix and the Universal Tree of Life. The shift of frequency forces all of the planetary inhabitants to shift into the newly exposed planetary frequencies and adapt to the accumulative impact of the shifting energies. All humans have a unique Blueprint and pace to keep aligned with the planetary frequencies. Right now we can access up to the 12th Astrological precession in the Inner Worlds timelines which includes another 288 possible organic timelines totaling 864 Timelines and ALL of those cellular memories and their DNA Fire Letters. See the Triune of Universes. Inner Sustainability is Integrated Spiritual Ascension and is the ultimate energetic sustainability when we self source from within our Soul and Monad connection, our personal spiritual source field connected directly with God. We end consumptive modeling and vampirism of other people's energies, when we are capable to self source and develop our spiritual bodies and clear Negative Ego and the Pain Body. See the Ascension Stages.